Let us commit the crime of dissection. We shall proceed to cut a Cioranian fragment open, exposing the innards and watching them ripen. The theme: time, the frame: “The Brown Bunny”. Bud suffers the asphyxia of becoming while caught up in the web of a projected past. His vision is clouded by the phantom of Daisy, of his past obsession. Every encounter with another woman, useless. Struggling to regain the present, to have a present and a future bereft of the monsterous past, he nonetheless gives it his best shot, only to be conquered by his own weakness, by the strength of the human condition: time. 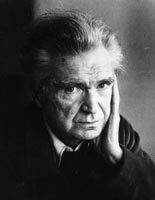 E.M. Cioran, in his Supremacy of the Adjective suggests that we are forever bound by our language. This observation generally addresses the human condition, more specifically, those who speak history into existence and color the past with their adjectival descriptions of it. The world changes in accordance with the words that we use to describe it. This shift in language constitutes our existential experience. To speak of God or “progress” is to speak them into existence in how we speak of them. In penetrating words to their core, unclothing them, we find that the meanings we ascribe them, disappear, decompose. Instead of manifesting meaning, they vanish into meaningless vocables. Culture is that which we have created by dint of the words that we use to symbolize it. Our descriptions of the world at once confine us and shift our understanding and experience of Being.